A Red Admiral Butterfly and large bumblebee were disturbed in Corbyn Crescent, Shoreham. After darkness, a large grey adult Fox rummaged around the black plastic rubbish bags in the western section (central area) of Corbyn Crescent in Shoreham town. Paul Graysmark rescued a caterpillar of the immigrant Convolvulus Hawk-moth, Agrius convolvuli, from being squashed as it slowly crawled across Corbyn Crescent, Shoreham. The caterpillars feed on Common Bindweed, but they cannot survive a British winter. Immediately, I opened the door in the early afternoon, a Red Admiral Butterfly flew over the front garden and on to the roof. 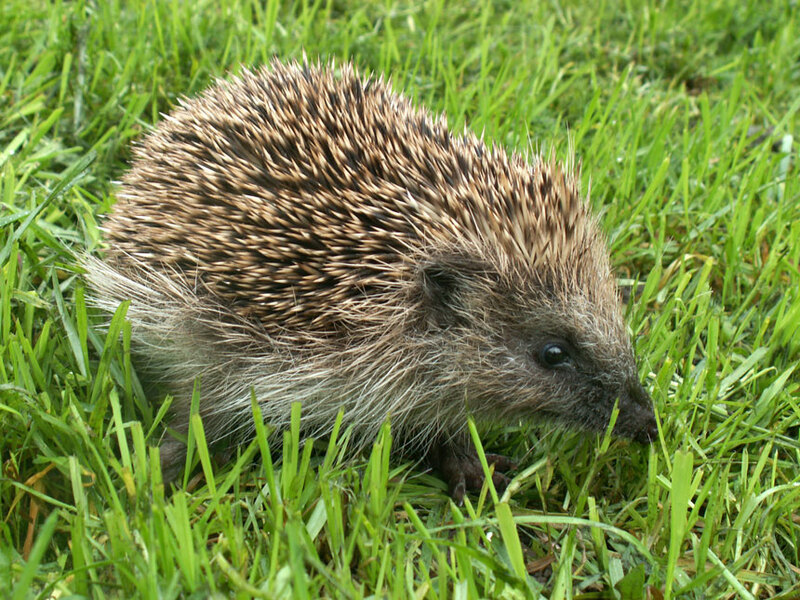 A young Hedgehog wondered over the wet grass of a back garden in Corbyn Crescent in the middle of the day (1:00 pm). The distinctive caterpillar of the Elephant Hawk-moth, Deilephila elpenor, was discovered in the middle of Nicolson Drive in residential Shoreham (an area with large gardens). As it was imminent danger of being squashed it was removed to my front garden. 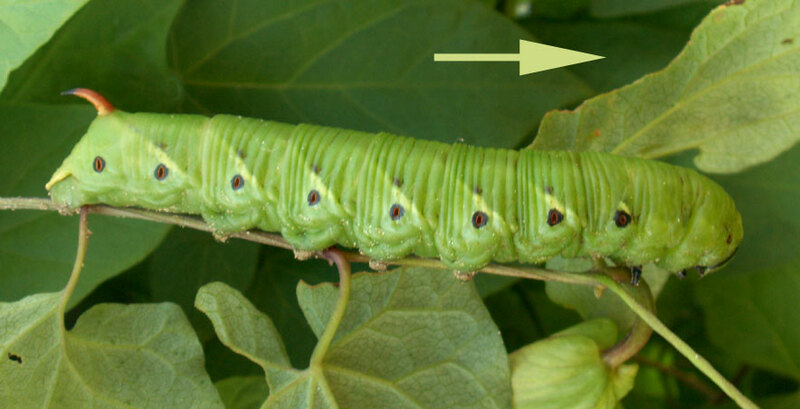 The caterpillar was not measured, but estimated to be about 70 mm in length. 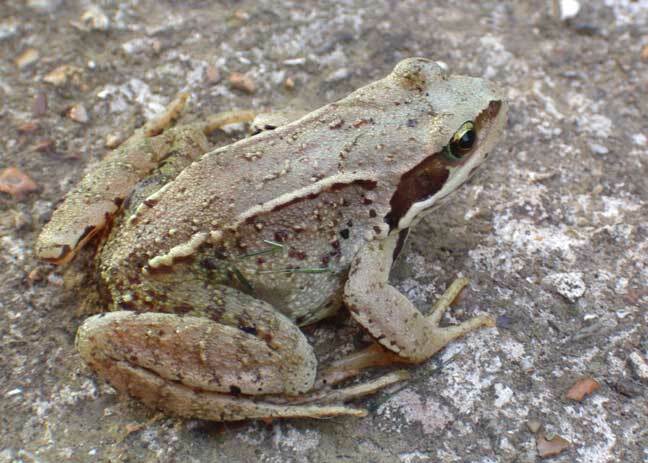 Just before midnight, a Common Frog was discovered inside my front door and chased back to the garden soaked by a recent shower. It might have been the one released into the front garden before. It did not squeal though and I could not see a hump on its back, but I would guess it was the same one. It may have been attracted to the light? 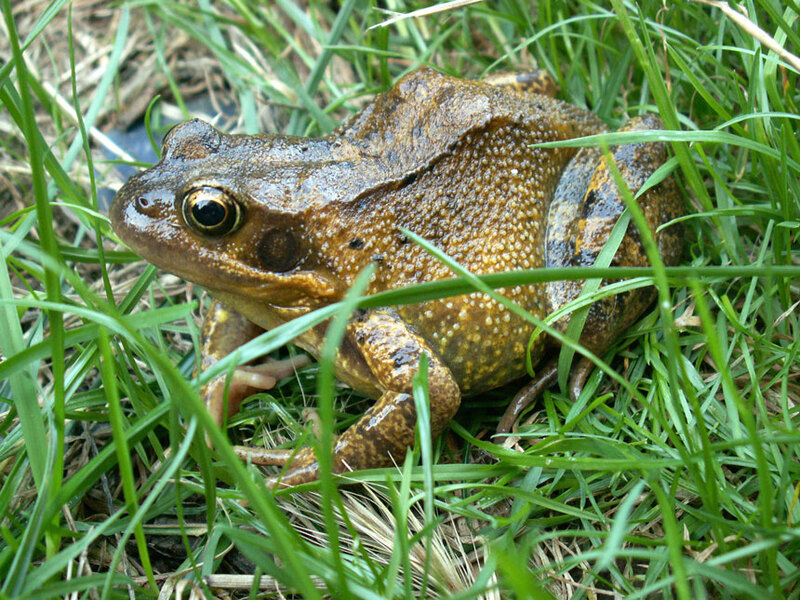 A Common Frog transferred from Sonia's back garden to my front garden pond made squealing noises as it was encouraged to jump into the pond. It was more slimy that usual to touch and seemed to have a bit of an unnatural hump on its back. A Small White Butterfly fluttered over Corbyn Crescent; nothing unusual about that. I put 25 gallons of tapwater in the Duckweed-covered pond and pulled out some vegetation. Three 10-spined Sticklebacks were netted and a tadpole that had not grown any legs. 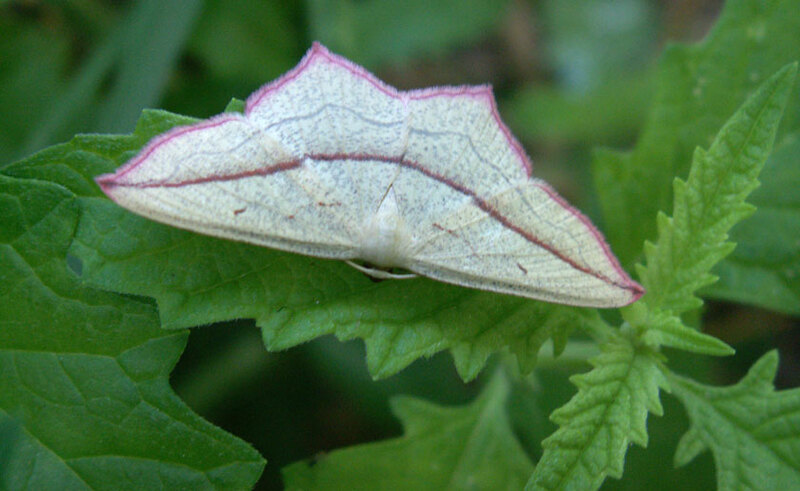 A Blood-vein, Timandra comae, and several Mint Moths, Pyrata auratus were seen in my front garden in Shoreham during the day. 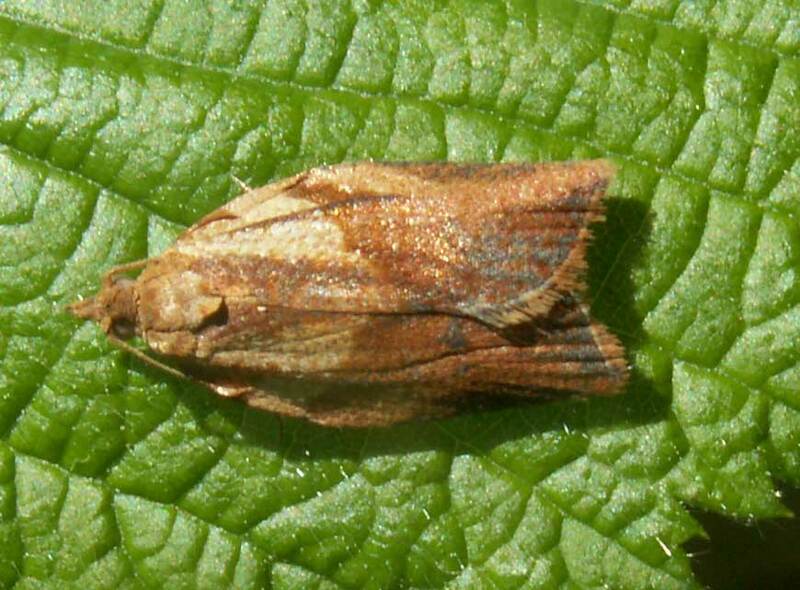 These are both small moths frequently seen and are probably both common species. The inconspicuous flowers of Gypsywort can be seen in my front garden in Shoreham. The first flowers of Water Mint have appeared in my untidy front garden. The surface of the pond is almost entirely covered by Duckweed, which probably came in with the frog spawn earlier this year. 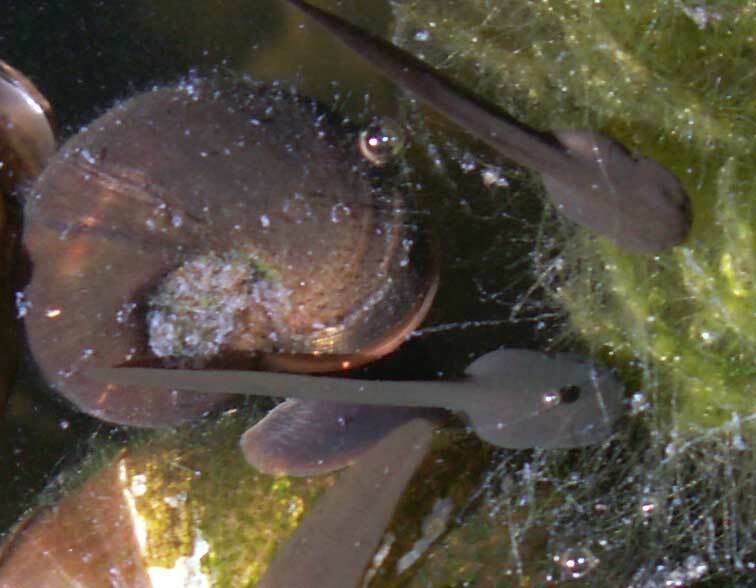 Most of the tadpoles still do not have any legs. A Garden Orb Spider, Araneus diadematus, in my front garden in Corbyn Crescent was big enough to capture butterflies. There was a Gatekeeper Butterfly in my front garden in Corbyn Crescent. A Creeping Jenny appeared at the edge of the small pond.The sepals on this plant are wide and definitive. 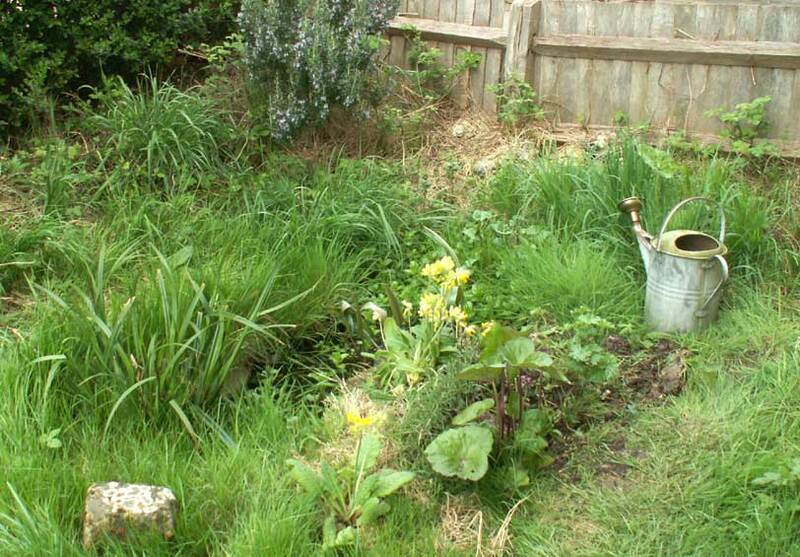 The pond itself had become so overgrown that I roughly hacked at the vegetation. The water level had fallen by at least 20 cm, so the margin ledges were now overgrown dry land. It was the warmest day of the year so far as the air temperature measured 29.8 ºC at 4:16 pm. This was the warmest temperature that I have ever recalled. It was too warm to venture out and the only two butterflies recorded were a Red Admiral in Dolphin Road near the Eastern Avenue railway crossing gates and a Large White in Corbyn Crescent, both in urban Shoreham. It was a surprise to see the first Hummingbird Hawk-moth of the year whirring around my uncut Garden Privet hedge before flying on. This was much earlier in the year than their normal first appearance. A young healthy looking Fox was caught in the car headlights in Corbyn Crescent, Shoreham, (it emerged from the pavement outside of the gardens on the east side) just before midnight when the air temperature was an astonishing 24.1 ºC. During the day it was the warmest of the year so far as the air temperature measured 29.2 ºC at 4:01 pm. Another "woolly bear" caterpillar of the Garden Tiger Moth, Arctia caja, crawled across the pavement in Dolphin Road, Shoreham. A "woolly bear" caterpillar of the Garden Tiger Moth was found dead (probably squashed) in my Shoreham garden. 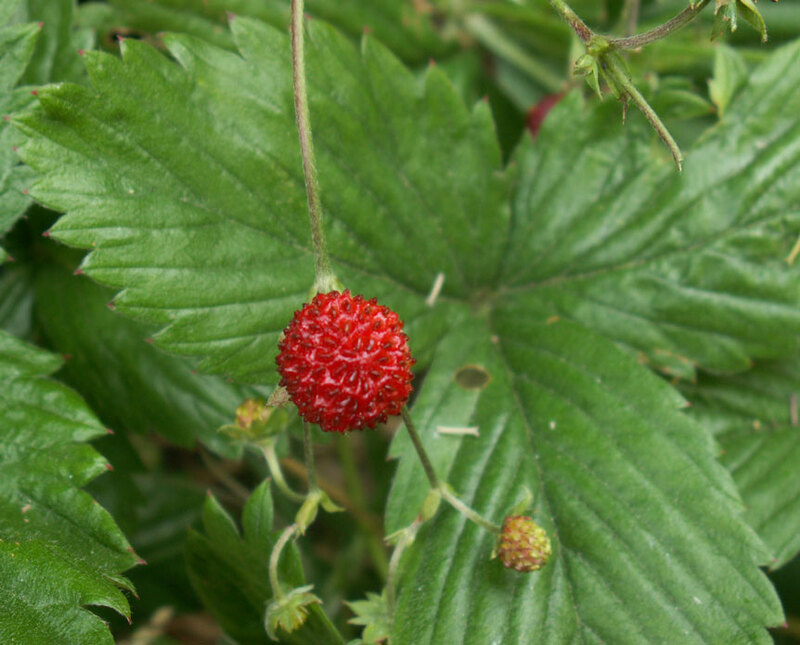 The tiny Strawberries growing wild underneath the Privet hedge tasted sweet and I must assume that these are escaped cultivars. A Blue-tailed Damselfly, Ischnura elegans was seen in my Shoreham garden. A dip into the overgrown pond with a small aquarium net caught a small tadpole without any legs and one 10-spined Stickleback. One of the small blue damselflies was seen near the overgrown pond. I am not sure which species. It was smaller than normal and was most likely an Azure or a Blue-tailed Damsel. This small moth settled on a Bramble leaf under the shade of the Garden Privet in my front garden in residential Shoreham. My identification is the the 998 Light Brown Apple Moth Epiphyas postvittana. 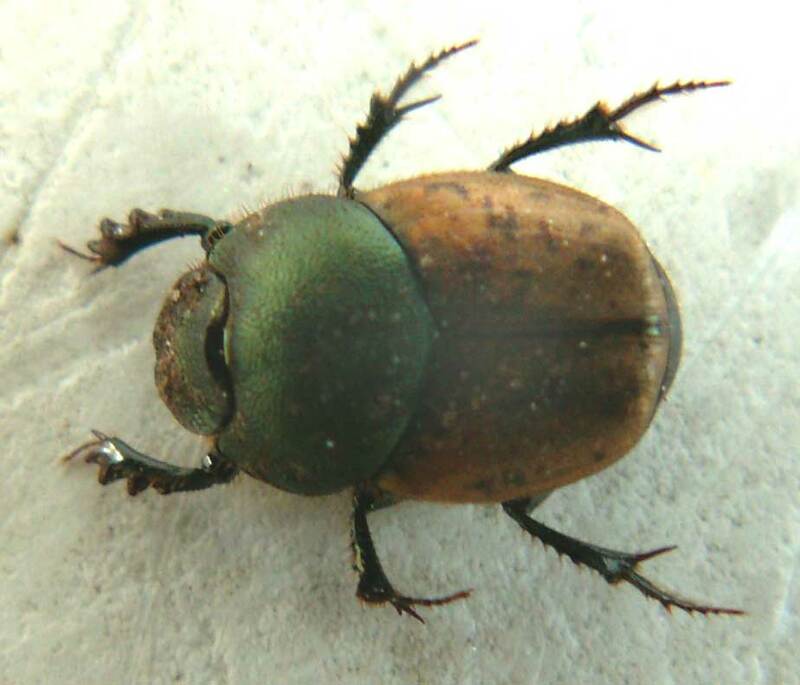 I thought this Garden Chafer, Phyllopertha horticola, spotted on my garden table was dead as it was very still and allowed me to turn it over. Then it flew away! 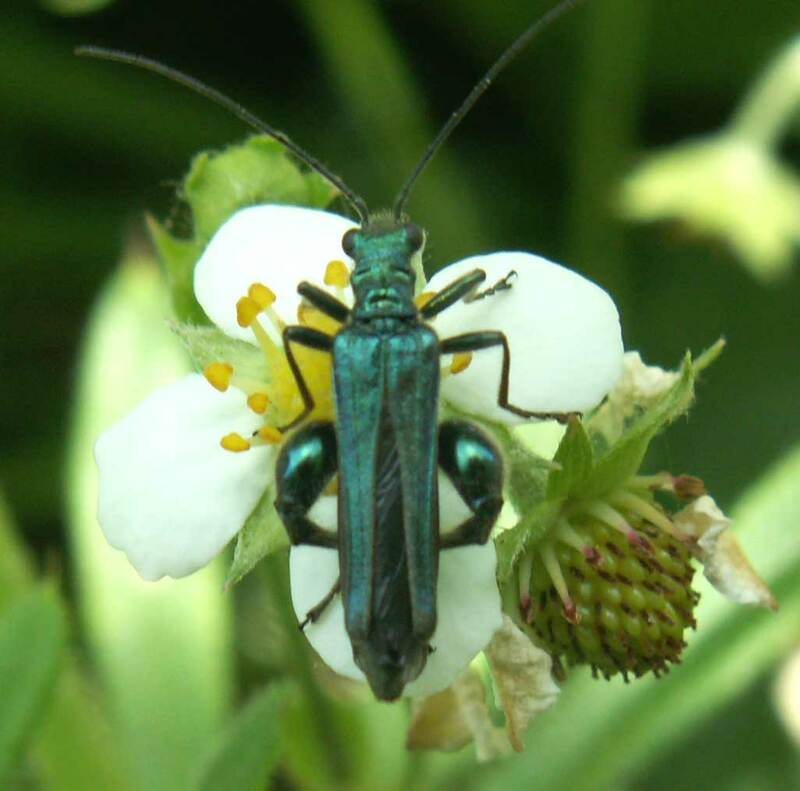 This insect is usually regarded as a pest species. The intermittent showers were a nuisance. The only saving grace were these pictures. The pond is overgrown with grasses and there is very little water surface. The hairy caterpillar that crawled around in my south Shoreham garden was probably a brown dull larva of the Muslin Moth, Diaphora mendica. 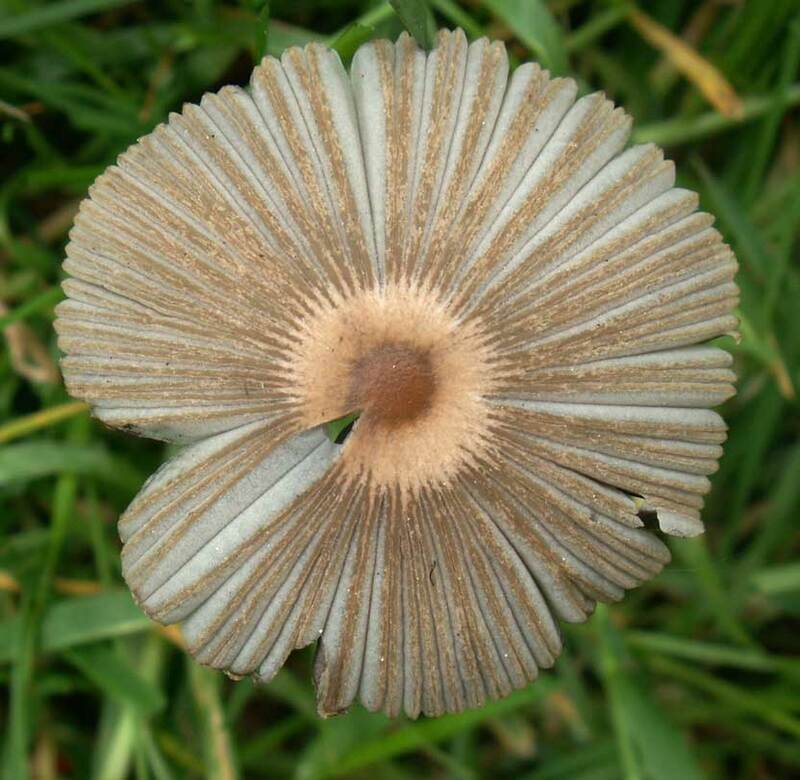 Another mushroom appreared amongst the grass of the species Coprinus plicatilis. An adult Common Frog made a visit to the edge of my pond, remaining so still, I was not sure it was alive until I tickled it and it made one leap into the weedy pond. The weed does not now seem to contain any blanket weed which occurred in the first year. The Pond Water Crowfoot cannot be seen and this seems to have lost out amongst faster growing vegetation. The Gypsywort seem to be surviving on the margins. These very small fly landed on a water plant. It is too small and it will probably escape identification for the time being. It may only be 5 mm long (rough estimate). A Spring (Hairy-footed) Flower Bee with a long tongue buzzed around the flowering Rosemary. 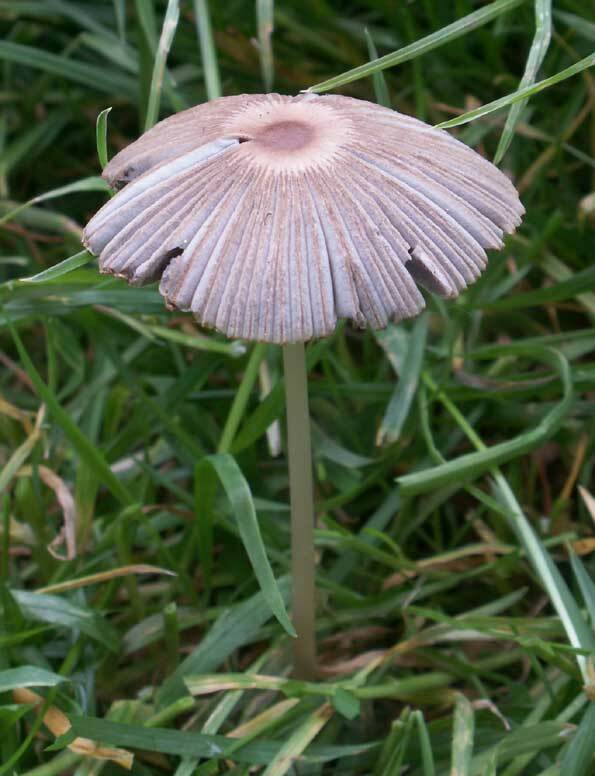 A single mushroom appreared amongst the grass of the species Coprinus plicatilis. 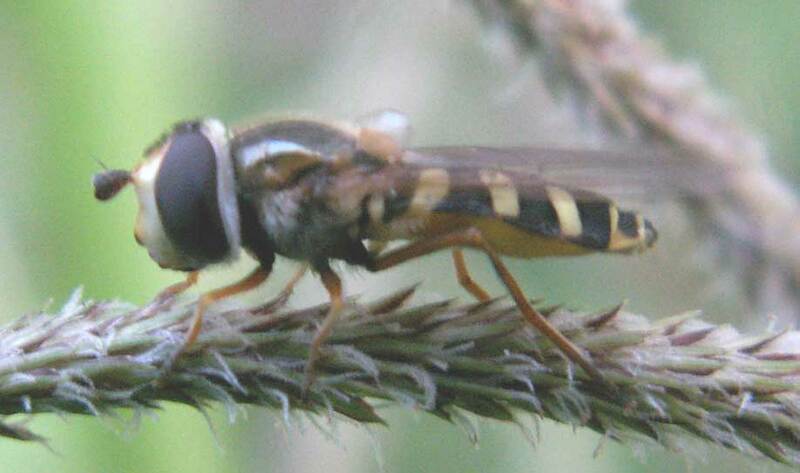 A small hoverfly on the reeds needs to be identified. 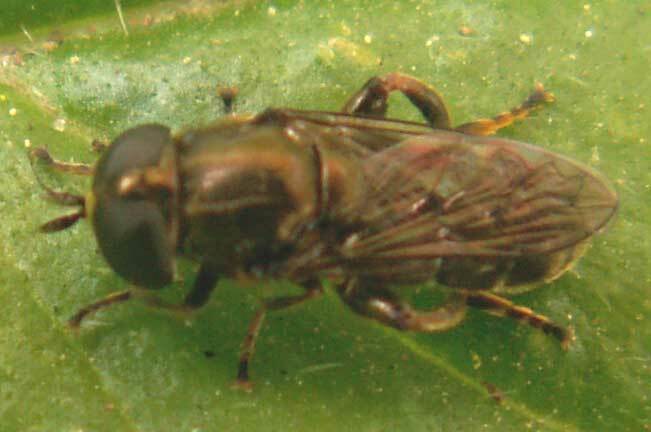 The small size of this hoverfly is misleading. 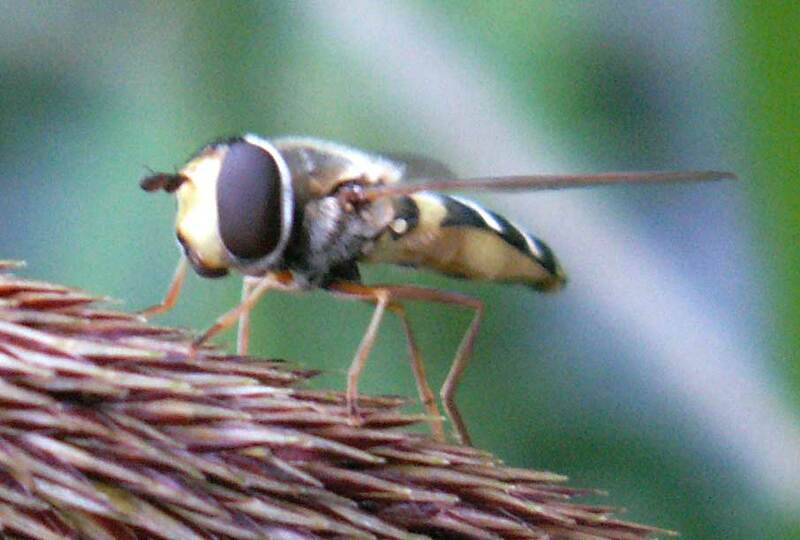 It must be Eupeodes sp.,although it much smaller, half the size of normal Eupoedes I have seen. The frog tadpoles still have not grown any legs. The Sticklebacks still have not been seen. 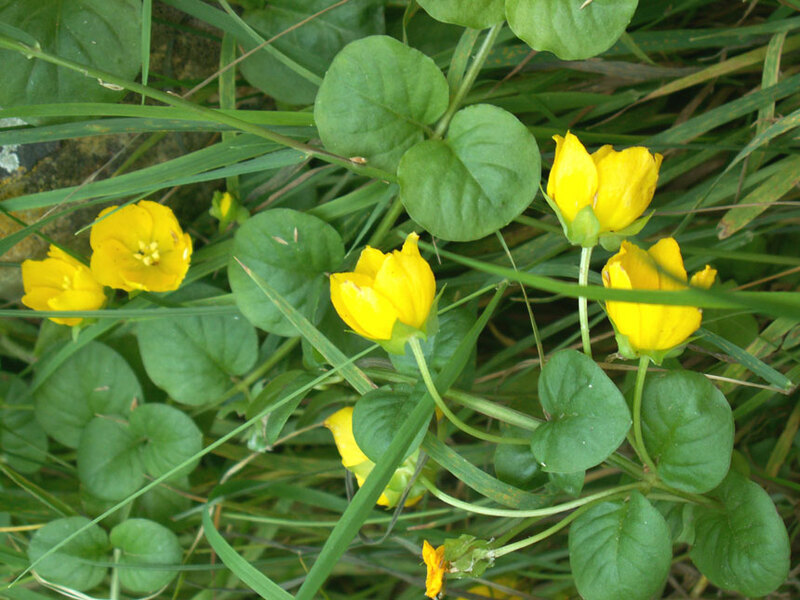 The Marsh Marigolds growing from the pond margins, submerged in water, were flowering, but the others were not. A small rockery was created with some small foreign shrubs and herbs. 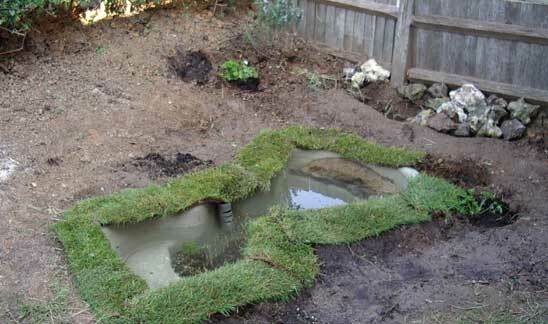 The rocks were already there and soil and plants were placed over them. The first web of a young Garden Orb Spider, Araneus diadematus, was obvious. 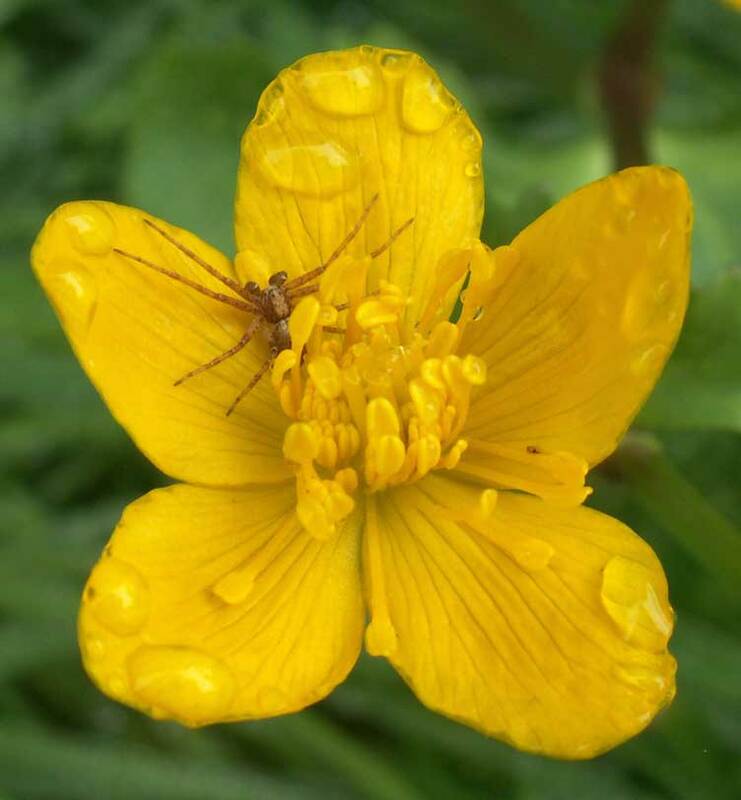 The first yellow Marsh Marigold flower has appeared from a clump gowing in the shallows of the pond, rather than the bog margins. In the warm sunshine, butterflies appeared almost immediately with a Speckled Wood and a Small White in the twitten between Corbyn Crescent and Middle Road, Shoreham. There was no sign of the Water Soldier plant either. It seems it may have got lost in the surfeit of water plants. 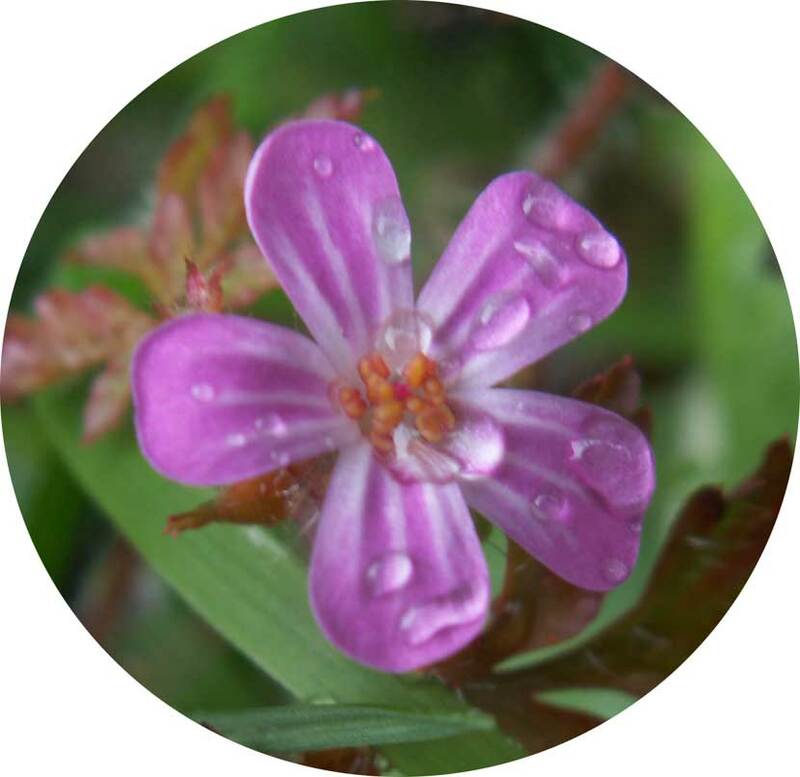 The pond and margins are being taken over by the most suitable plants for the small habitat. A Red-tailed Bumblebee, Bombus lapidarius, was buzzing around the garden looking for a hole for the second day in succession. I introduced a few cultivated plants to the front garden including Cowslips and Spotted Deadnettle. They are not expected to settle in until next year. A first butterfly in my Shoreham town garden, a Small White, did not so much as visit, but fluttered over the Privet hedge. The surface of the small pond was teeming with frog tadpoles but there were no Sticklebacks to be seen. 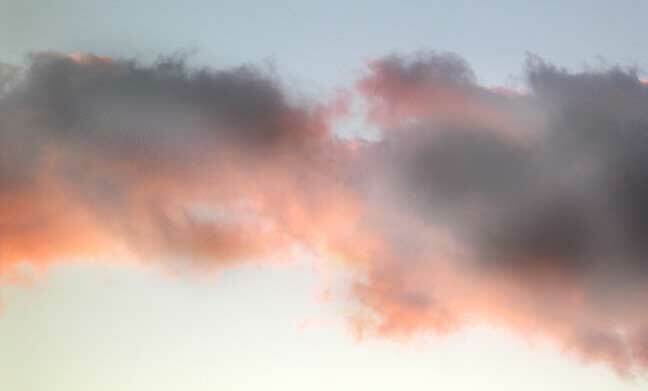 A Swallow swerved between the gap in the semi-detached houses to the east of my home and headed north between the gap in the houses on the other side immediately north of my window. 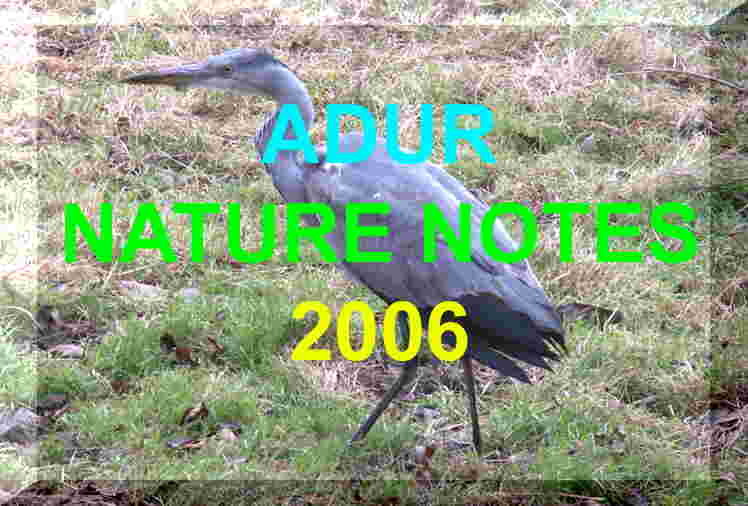 I thought its plumage looked dirty and I wondered if they moulted after immigration? At four pairs of 10-spined Sticklebacks were chasing each other and a couple were observed mating in the surface waters of the weedy pond. There were probably many more sticklebacks and hundreds of small frog tadpoles were still wriggling amongst the weed as well. 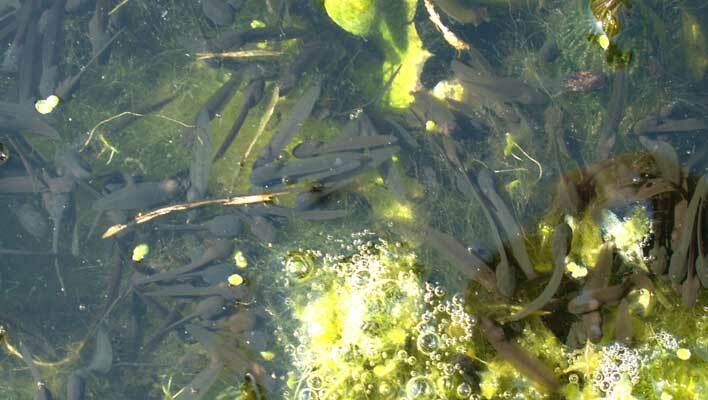 Frog tadpoles are wriggling about near the surface amongst the vegetation that covers most of the surface, but the 10-spined Sticklebacks seem to be attacking them continuously. Some of the frog spawn has changed appearance and hatching of the eggs into free swimming tiny tadpoles is imminent. The 10-spined Sticklebacks take an active interest in the spawn even before the tadpoles have hatched. The Backswimmer Water Boatmen are no longer to be seen in the surface waters. A gallon of frog spawn was introduced to the pond from a north Shoreham garden. Alas, I forgot to inspect the spawn for Duckweeed. 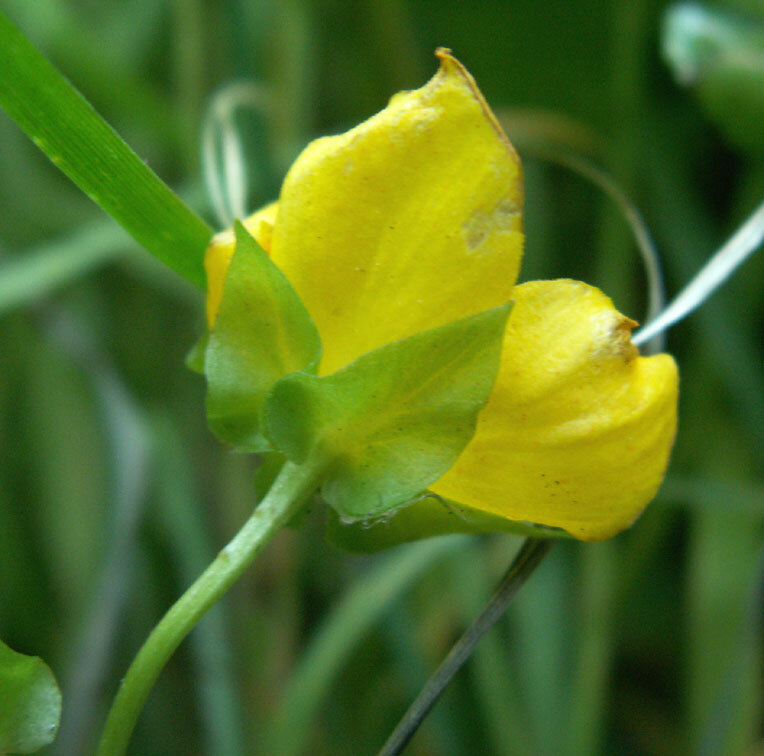 The large leaves of an unknown plant were seen growing in a boggy area to the south of the pond. My first mollusc of the year was a Pond Snail (to be positively identified) in my Shoreham front garden.